Friday, January 11, 2019, at 5 p.m. and 8 p.m. 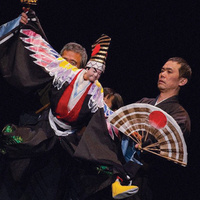 Experience traditional Japanese puppet theatre in a rare performance outside of Japan by renowned bunraku ningyo performer Kanroku and his company, Mokugu-sha. Taking inspiration from antique bunraku puppets from the USC Libraries’ East Asian Library, Kanroku and Mokugu-sha will create a special piece for the USC community. The performance will explore the tension between social obligations and personal desire—a conflict at the heart of the bunraku repertoire—and highlight the expressive possibilities for storytelling with non-human puppets and creative experimentation by bunraku ningyo practitioners past, present, and future. Renowned Japanese bunraku ningyo puppeteer Kanroku studied at the National Bunraku Theater in Osaka under Master Kanjuro Kiritake II, and was named Kanroku Kiritake in 1979. He then apprenticed under Minosuke Yoshida III, and was renamed Kanroku Yoshida in 1987. In 2006, he started his own theatre company, Mokugu-sha. Kanroku teaches and practices the classical pieces of bunraku ningyo theatre while pursuing contemporary projects and collaborating with artists working outside of bunraku. Presented by USC Visions and Voices: The Arts and Humanities Initiative. Organized by Rebecca Corbett (USC Libraries), Velina Hasu Houston (Dramatic Arts), Oliver Mayer (Dramatic Arts), Satoko Shimazaki (East Asian Languages and Cultures), and Maki Aizawa (Sonoma Cultural Exchange).